On one hand the personality thrives in the midst of a space-bound and time-bound existence. On the other hand the spiritual seer has the experiential contact with a status of reality marked by spacelessness and timelessness which characterize the dimension of impersonality. The Jivatman or the Soul or the Unborn Spirit is poised in a zone of Consciousness where it can relate simultaneously to both the states of personality and impersonality, space and spacelessness, time and timelessness. To relate with the state of the space- bound and time- bound personality, the Jivatman or Central Being projects the Psychic Being in the evolutionary matrix. The Psychic Being thus takes part in the saga of space and time but as it is a projection of the Unborn Spirit, it has to possess logically some characteristic to outgrow the limitations of space and time. This characteristic is displayed by the Psychic Being in its assimilation of the most intensely lived moments in a life-time which are encrypted in the consciousness that survives the life-span of an individual so that such transcripts can be available as links in some future space and time bound reality. 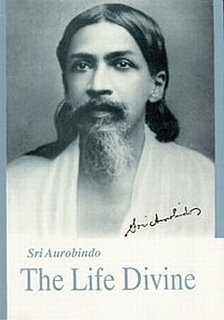 The Jivatman also relates with the Cosmic Reality that can only be accessed by transcending the space-bound and time-bound ego so as to reach as if an expanding 'circle without any circumference' (Sri Aurobindo, Savitri, pg 554), a centre in ethereal space which can only be a centre that is not linked with space and time but with consciousness per se. Finally the Jivatman relates with the Transcendent Reality that is beyond our cognitive appraisal and thus beyond our constructs of space and time as well as our constructs of spacelessness and timelessness and yet supports the matrix of space and time.